Having lived in Manchester for 15 years and run Oscillate Recordings in the city centre for the past six years, I’ve eaten at most places in the Northern Quarter. Whether they’re local or visiting the studio from London, for example, most artists ask me where is the best place to take a break and get a meal. So I thought it would be useful to compile my favourite eateries close to the studio for anyone else who is interested. This tiny Mexican independent restaurant and bar has the benefits of being about 10 metres away from Oscillate Recordings. Since it opened two years ago, it’s become one of our favourite drop-in places. We can’t get enough of Mexican food, the portions are enormous AND they will box up your leftovers without even being asked. Sounds good eh? Also, top tip, check out El Capo’s Facebook page for their incredibly cheap Taco Tuesday and Wings Wednesday. 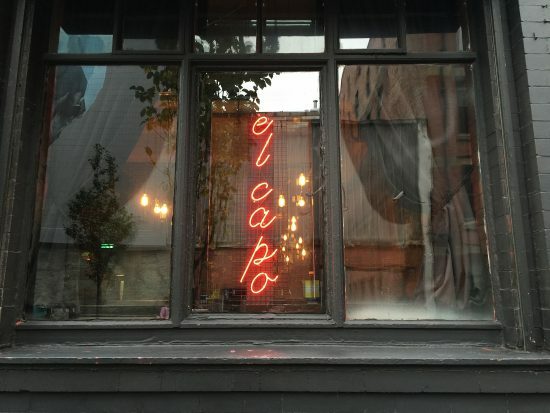 El Capo, 12 Tariff Street, Manchester, M1 2FF. This bar is one of the first trendy bars that opened in the Northern Quarter, long before there was much else around this part of Manchester. 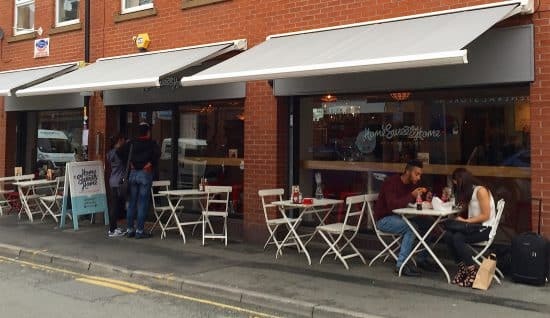 Since then, it’s doubled in size and had a major re-fit and despite growing consistently in popularity, it’s still a great place to grab a very reasonably priced lunch. The food has always been good, and consists of an excellent brunch menu, loads of burgers, and some very good Asian-inspired dishes, including a tasty kimchi slaw. Also check out the amazing cakes and donuts before you leave – they are delicious. 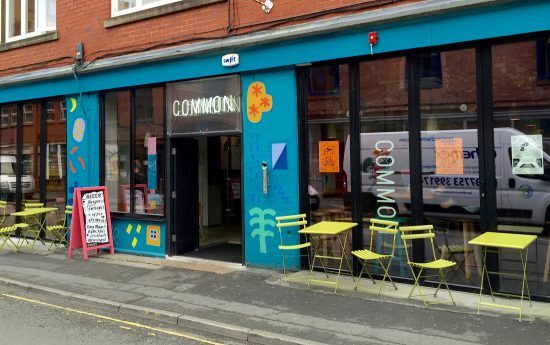 Common, 39-41 Edge Street, Manchester, M4 1HW. It wouldn’t be a list of cheap eats without mentioning one of the ‘rice and three’ lunchtime curry haunts. 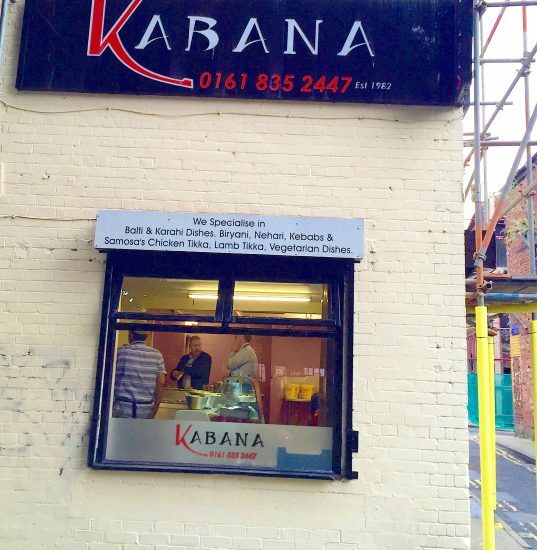 To be honest, This and That probably gets more mentions in the press, but here at Oscillate Recordings we tend to lean more towards Kabana, plus it’s closer to the studio. For around £6, the traditional ‘rice and three’ means you can choose three of the curries they have that day, which will be piled onto one plate with some rice. It’s good, but we tend not to opt for that unless there is a sofa to lie down on afterwards, for it’s a hefty portion of food. If you actually have to get back to work after lunch, it’s a good idea to have a bowl of one curry, and maybe a chapatti. Top marks also go to the samosas, which are about 50p and you can drown in mint sauce and other chutneys. Definitely worth a visit, but get there early or you won’t get a seat. This cute American diner place on Edge Street, next to Common, is also a great place for lunch. It’s also expanded to about three times the size, and opened a sister restaurant in the Great Northern, since it launched. The food is amazing, but it’s pretty busy even in the week, and has queues out the door on a Saturday. The lunch offerings are enormous portions of American-inspired diner food, and the cakes are absolutely crazy – if you love a sugar-hit, they are for you. For anyone in a rush, Go Falafel is your best bet with some healthy and delicious salads, as well, of course, as the falafel wraps. The wraps are really food value for money as they are crammed with salad, yoghurt sauce and chilli sauce. If it’s a nice day, eat your wrap at Piccadilly Gardens for some fresh air and vitamin D, before heading back into the studio. Go Falafel, 3 Newton Street, Manchester, M1 1HW. Right, we’re sticking another Mexican place on the list, because you can’t do cheap eats without including the Arndale Food market. The Arndale used to be a sad tired place, but about 10 years ago, they stuck a huge new modern extension on the back of the existing shopping centre, with a large food market. There’s a very good selection of food stalls, and all of them good value. There’s a large open seating area in the middle too. Again, it does get busy but people don’t tend to linger so a seat always seems to appear when you need it. 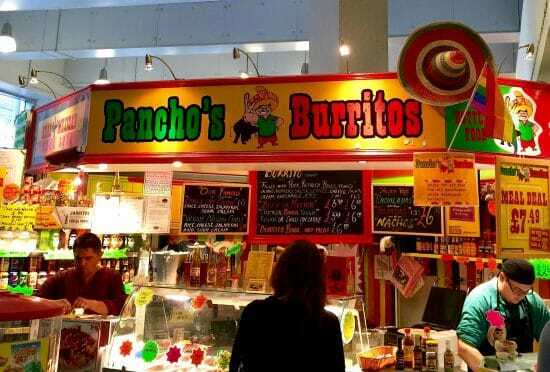 Pancho’s does amazing burritos and other Mexican street food, which is excellently spicy. They also do take-outs so head back to the studio for a plate and cutlery if that’s your bag. Takk is a coffee shop just down the road from the studio, which is popular with freelancers and creatives. They do a pretty good brunch, but have a limited menu as it’s mainly a coffee shop. BUT the reason they’ve been included on this list is because they do the best chocolate brownies in Manchester. And just to make sure of this fact, we’ve been sampling them very regularly. And yep, they’re amazing. They are huge and when you’re flagging after being in the studio all day, a coffee and a Takk brownie is all we need to get through the day. Takk Coffee House, 6 Tariff Street, Manchester, M1 2FF.